There is a Power in Community… and that’s what we are… a Community. Leo Baeck Temple needs the wisdom of its elders, and its elders need each other. All are welcome to attend our programs. Now in its eighth year, the Community of Elders (COE ) continues to thrive. Each year, the group strives to engage the community in a variety of programs with the goal to address intellectual, spiritual, artistic, political, and emotional, as well as physical health issues. 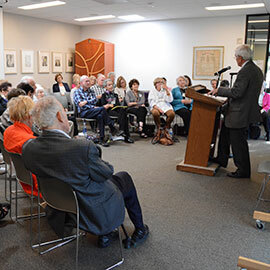 The COE fosters social connections with one another and interacts with the larger Temple community through intergenerational events. The group also provides opportunities for outreach and social action for justice in the Los Angeles community and beyond. The entire LBT community is invited to all COE events.